Researchers have embarked on the first comprehensive study of human activity along the west Kimberley coast. Over the next two years, researchers from Murdoch University and the University of WA working together on the WAMSI Kimberley Marine Research Program, will build a picture of how people currently use the coastal areas of the Kimberley and learn more about how that may change in the future. 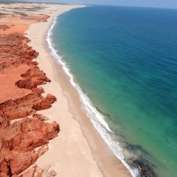 Researchers will map human activity along 80-Mile Beach, Roebuck Bay, the Dampier Peninsula, Buccaneer Archipelago and Camden Sound using low level aerial surveys. Professor Lynnath Beckley from Murdoch University said the study would provide essential benchmark data to help with planning future development in the region. "We will create maps of which sections of the coast are used, what these people are doing, and ascertain how many people are engaged in coastal activities," she said. "These surveys will be done over weekends, weekdays and during the wet and dry seasons to get a sense of how human activity changes throughout the year. "We are interested in all people in these areas – whether they are tourists, Indigenous residents, or people working in different industries." The study will also examine the values people hold for this region and how they would like to see it managed in the future. "We will be interviewing around 150 people including tourists, Indigenous and other residents, as well as industry and government workers, to better understand what they value about the west Kimberley coast and their aspirations for the future" said Associate Professor Sue Moore from Murdoch University. This information will then be integrated with biological and physical data to assist decision-making in this rapidly changing region. Professor Beckley said the study would provide tools to plan for conservation areas, especially how to better include information on where people go, what they do and what they value. "This sort of information is essential for planning conservation and future development in a way that acknowledges the unique ecology of the Kimberley and the strong values held for it by society," said Professor Beckley.